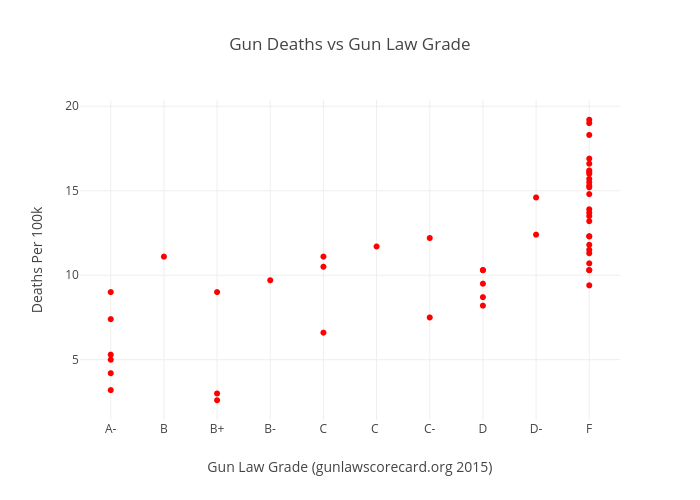 Ccclasen's interactive graph and data of "Gun Deaths vs Gun Law Grade" is a scatter chart, showing Col2; with Gun Law Grade (gunlawscorecard.org 2015) in the x-axis and Deaths Per 100k in the y-axis.. The x-axis shows values from -0.54086302713305 to 9.54086302713305. The y-axis shows values from 1.5098567613498424 to 20.290143238650156.